Inside every nice girl is a naughty woman dying to get out! Frustrated author Scott Lawrence is hoping to get lucky in more ways than one. A little fun in the sun with a beautiful woman may be just the inspiration he needs to cure his writer's block. No fuss. No commitment. But a 'good girl' like Allison? No way! THEN IT'S TIME FOR ACTION. When Allison makes her move, every bachelor bone in Scott's body tells him to swim for safety. But stronger instincts prevail, and the heat climbs higher than the temperature on the Texas Coast. Now a four-letter word called love could turn a sweet spring diversion into the most unexpected and complicated fling of their lives. 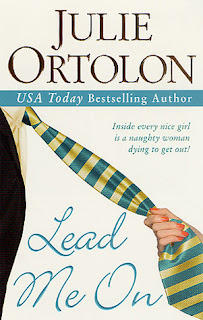 LEAD ME ON was an okay read. It started out with a bang and I was expecting to add another book to my favorites list, but it seemed to fizzle out in the middle. The characters as well seemed to fluctuate. I started out loving Allison and not caring about Scott and by the end the opposite was true. But at least they were fleshed out well enough for me to have such passionate opinions on them. Basically though, I'm just kind of "blah" about the whole book. Don't get me wrong, there were some really good things about LEAD ME ON as well. Writing is excellent, I especially loved the history/romance of Jack and Marquerite. It builds on a lot of what we learned in the first book of the series (my review of the 1st book can be found here) as well. For that reason, the books in this trilogy really don't work well as stand-alones in my opinion. There's so much history divulged that doesn't really recap. Ultimately though, I just couldn't get excited about this book (real life has more to do with that than the quality of the book though). I enjoyed it yes, but I'm glad to move on. I've already started reading the final book in the series and hope to have that review up next week. Along with the bonus chapters reviews. As a small aside, I apologize for not posting a review in awhile. There has been a death in the family that I took a little harder than I thought I would, and I haven't been able to get excited about anything… even reading. That's the reason for my neglect of commenting on other blogs too :(. The funeral is tomorrow and I'm really hoping things go back to normal afterwards.